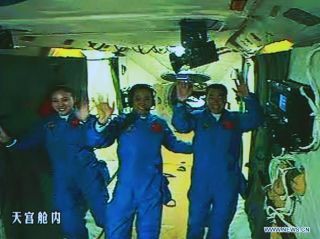 China's three Shenzhou 10 astronauts wave to the camera after entering the Tiangong 1 module. Image released June 13, 2013. A Chinese space capsule carrying a crew of three docked with the nation's orbiting space module today (June 13), two days after launch. State media reports that Nie Haisheng, Zhang Xiaoguang and Wang Yaping — the second female Chinese astronaut to fly in space — automatically docked their Shenzhou 10 spacecraft to the Tiangong 1 module at 1:11 a.m. EDT (0511 GMT). The astronauts entered the orbiting module at 4:17 a.m. EDT (0817 GMT), beginning a 12-day stint onboard the space laboratory. At 15 days in space, this mission is scheduled to be the longest spaceflight for a Chinese crew in the history of the country's space program. "The Shenzhou 10 spacecraft has been successfully launched and precisely put into orbit, which means that our country's fifth manned space mission has succeeded in the first phase," said China's president, Xi Jinping, according to state-run news agency Xinhua. "At this very moment, I am sharing the same feeling with everyone. I am very happy and excited." During their time on Tiangong 1 (also known as the Heavenly Palace 1), the spaceflyers will dock their spacecraft to the module once more using manual docking procedures and perform experiments. The crew is also expected to send down a science lesson to Chinese school children on Earth at some point during their stay. Shenzhou 10 is the last of three missions designed to help master space-based docking and rendezvous technology, officials have said. The mission is expected to help the Chinese space agency gain necessary experience that can be applied to building and operating a larger space station by 2020. The eventual 90 ton orbiting station will have three capsules: a core unit and two laboratories, according to Xinhua. Tiangong 1 has orbited Earth since Sept. 2011, and is scheduled to remain operational for another three months. Eight other Chinese astronauts flew in space before the Shenzhou 10 mission, with the first crew docking to the module in June 2012. China's first astronaut, Yang Liwei, was sent to orbit in 2003, making China the third nation — after Russia and the United States — to launch astronauts to space using its own vehicles. Editor's Note: This story was updated to correct the docking time from 1:18 EDT, to 1:11 EDT. (The latches between the Shenzhou 10 spacecraft and the Tiangong 1 module were secured at 1:18 EDT). This story was also updated to reflect the fact that eight Chinese astronauts have flown in space.